This post is a list of shortcuts for the Sony PRS 650 Touch Edition and PRS 350 Pocket Edition, along with some helpful tips and tricks. Here are links to some earlier Sony Reader posts that you may find useful as well: How to get free news feeds for a Sony Reader with Calibre’s news fetch feature; How to change fonts on a Sony Reader. Please feel free to leave comments about any other PRS 650/350 shortcuts, hot keys, or hidden features that you may happen to discover. Power Off: Slide and hold power switch for 3 seconds. Power On/Sleep: Slide power switch and release. View Clock: Tap Options while reading, clock appears for 5 seconds in place of the page numbers. Go Back in Menus/Return to Book List: Hold Options button for 3 seconds. Press font button + page-forward/page-back buttons to quickly Zoom in and out with the custom Zoom dial. Jump to Page: Tap page numbers at the bottom of the screen to bring up the page dial to enter a page number. 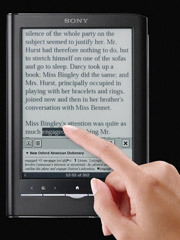 Quickly Scan Through Pages: Swipe and hold down on the page, or hold page-turn buttons down. Input optional characters with keyboard: Tap and hold a character, a pop-up appears with optional characters if applicable. Add/Delete Bookmark: Double-tap top right corner of screen; or hit options then add bookmark. Add Highlights: Double-tap, hold down and drag cursor, release, then tap the highlight icon when the dictionary pop-up appears; or hit options then add notes then create/edit to use the notes and highlights menu. Add Notes: Tap a highlighted word or bookmark to add freehand or typed notes to it; or hit Options then Notes and Create/Edit to add freehand notes directly on the page. There’s also a Text Memo app in the applications menu on the Reader’s homescreen for typing notes with the on-screen keyboard. Export Notes and Highlights: Plug the Reader into your computer with the USB cable, open the Reader software if it doesn’t open automatically, navigate to the book with the notes/highlights using Sony’s Reader software, open it, and then click the green icon on the lower left to export the notes as an RTF file. Word Search: Double-tap a word and then select the search icon from the dictionary pop-up, or hit Options then tap search to use the keyboard to input a word. Change Dictionary: Double-tap a word to open the dictionary pop-up, then tap the dictionary’s name to bring up the list of other dictionaries, or go to the device’s home menu then select settings then application preferences to set the default dictionary for the PRS 650 and PRS 350. Change screensavers: First add images to the reader via USB or memory card. Go to Pictures in the Applications menu then hit Options then tap Select Standby Screen to choose images for standby. If more than one is selected it changes the image each time the Reader goes into sleep mode. The battery charges in 3 hours connected to a computer’s USB port or about 2 hours when using the optional AC adapter. Power off the Reader completely if not in use for more than 1 day. Do not let the battery remain uncharged for long periods of time. Use the device at normal operating temperatures: 41°F to 95°F (5°C to 35°C). Export Drawings: The handwritten notes are stored as SVG within XML files in the directory “/database/media/notepads”. Elements in the “xs1″ namespace are the important ones; you have to remove the others to load in Inkscape, for example. You also have to add width=”600″ and height=”710” to the svg element to get the dimensions right. Sweet. Thanks for letting us know! does not work to highlight multiple words…. I can double tab to highlight a word, which also brings up the dictionary too but hold down on the word and drag cursor simply advances me to the next page and not selects multiple pages. I want to select multiple words, please help. touch & release,(fast) touch & DONT release but start to drag. When I try to read an ePub file in landscape mode, it normaly repeats two or tree lines each time I change page. That’s really anoying…. so I can only read in portrate mode. Did anyone also notice that? Can we change it? I hate that too. Sony is the only one that does that. It makes landscape mode about useless. I just got my sony pocket edition and I love it but it keeps jumping ahead and I have go back and find my page. Am I doing something wrong. It happens 2 or 3 times every time I use it. Its frustrating please help…. I’ve never heard of that happening. I’d suggest exchanging it from where you bought it. This blog is very helpful, I’d say essential for all customers, who ( myself included ) were too lazy to read the manual ( even on the device 😉 ). I’m unable to turn it on (battery has been recharged). It is not longer reconignized by my Pc. 5 seconds reset has no effect. I only have a red or orange twinkling led at the top, nothing on the screen. my prs-350 is out of guarantee.